The Vedas envisage the human body as a replica of the Cosmic Person, Purusha. The body and the Self stand respectively for Nature (Prakriti) and Cosmic Self (Purusha). Technically, the worlds are an extension of the spheres that exist in the human body. If the macrocosm (jiva) is a reflection of Isvara in the tamasic aspect of Nature, the microcosm (Viraj) is a reflection of Isvara in the tamasic aspect of Nature. The Vedas therefore suggest a simple and straightforward approach to communicate with the Supreme Brahman and worship Him. It is by withdrawing into one's inner world and performing an internal sacrifice in the form of concentration, meditation and self-absorption. This leads to an awareness of your inner world and oneness with the Supreme Self. Historically speaking, the concept of internal sacrifice is perhaps the single most important factor in the development of the spiritual side of Hinduism, which lead to the invention of many yoga techniques and the formation of the yoga philosophy. It transformed a ritual religion into a spiritual religion with profound philosophical depth, providing an incredible insight into the nature of human personality and our very existence. The later Upanishads do consider the body as impure and disgusting, probably due to the growing influence of ascetic movements within Hinduism and a change in perspective. But the early Upanishad unmistakably show remarkable reverence for the body and consider it a sacrificial place where gods and humans join their hands in the sacrifice of life. In their conception, the body was pure and divine as along as it was inhabited by the gods and became impure when they and the Self departed from it. It was an universe in itself, with the feet and legs representing the earth, the chest and the stomach representing the mid region and the head the heavenly region. Unless you are particularly drawn to monastic religions and ascetic way of life, I believe reverence to the body is an integral part of your self-acceptance and respect for life and all the complexity and diversity it represents and upholds. In spiritual life, we may use negativity towards our bodies to cultivate detachment and sameness, but in the end to be free in a real sense we have to renounce all notions of negativity and reservations against them. Shankaracharya of Kanchi once said in a discourse that the gods and goddesses of Hinduism are the highest among the living beings, who exist within us and also outside of us as beings of light and pure delight. In stating that, he echoed an important truth from the Vedas. The body is an abode of gods. They are an inseparable part of our existence. They share our joys and sorrows and witness our actions. They are also our partners in our virtuous and sinful actions. Through our actions and offerings we nourish them and support them; and in return with their superior knowledge and mastery over the elemental nature, they fulfill our desires and protect us from evil. To the extent we perform sacrifices and nourish them, they respond positively or negatively to our prayers and invocations. It is necessary to know that the gods live within us as our organs. They participate in our daily actions and share our thoughts, feelings and emotions. If we are happy, they are happy. If we suffer they suffer. If we turn to evil, they become infected with evil. In your body you are the lord and the divinities are part of your inner microcosm. They obey your will and carry out their duties. They may not know you, just as they do not know clearly about Brahman in the macrocosm. They perform their duties rather mechanically and habitually and respond to your desires and intentions. The Vedas affirm clearly that each human being, irrespective of gender, creed and caste is a cosmic person (Purusha) embodying the highest, the purest and limitless Self in a microcosm which is a world in itself. The devas help us in our mortal bodies in various ways. They act according to our desires, as long as we nourish our bodies and strengthen them. They lose their vitality if we give up desires and pursue Brahman. The Upanishads suggest that the gods are not pleased if human beings seek immortality because they do not want to miss our services and sacrifices. Just as we are unhappy if we lose our cattle, they are unhappy if they lose their supporters and nourishes. They deities in our bodies are immortal. They do not perish when the body of a mortal being dies. They circumvent death and escape from the body in a subtle form along with the breath, which helps them to return to their spheres. The gods are eternal and youthful, full of vitality. They thrive on pleasure and the prospect of pleasure. Since God subjected to hunger and thirst in the beginning of creation, they need constant nourishment. Unfortunately, they cannot make their own food. Hence they depend upon us for food. In Hinduism, sacrifices are performed not to appease gods but to nourish them actually. We cannot see the subtle forms of the gods directly with our eyes. Yet, in the microcosm, they are our eyes and ears. In the body they are controlled by breath (prana). The Chandogya and Brihadaranyaka Upanishads affirm that once the organs had a argument among themselves as to who was the greatest. Having argued, each of them left the body and returned after a year. The body was still alive, although disabled in some aspect. Thus, when the eye left, the body was unable to see, but still alive. So was the case with they ears, nose, speech etc. But when breath tried to leave, all the organs rose with it. With that the organs realized who was the most superior and agreed to share food with it. The Upanishads further suggest that breath then helped each organ get rid of evil, by carrying them to the end of the quarters and dropping off their evil there. Since the organs and breath share the same food and breath circulates the essence of food among them and becomes their essence in turn, the sense organs in the body are also called breath (pranas). Thus the body is nothing but a breathing body and the Self is known as the breathing spirit. The organs also differ from breath in two other respect. The organs are motivated in the body by desires. Since they are guided by desires, they are vulnerable to selfishness and evil. Breath, on the other hand, acts involuntarily and is not susceptible to desires. In other words, whether you like or not, whether you want it or not, you have to keep breathing to be alive. While the organs are controlled by the mind and intention, breath is not. The second difference is breath is not subject to fatigue in the body where as the organs are subject to fatigue and sleep. This is related to the fact that you keep breathing when you are asleep. While the organs are withdrawn and restful in sleep, breath still goes on. The Shankaracarya also stated that the gods operated in three different planes and in three different planes or forms. By knowing them and their aspects, and learning to communicate with them we could benefit from our association with them and secure their help in all the three planes. Such knowledge would not only help us to perform our duties but also to work for our self-transformation. Of the three levels in which gods exists in creation, one is external and two are internal to the mortal bodies. They are adhidaivika (divine), adhibhautika (elemental) and adhyatmika (subtle). Of these, the first kind exist in the macrocosm only, that is outside our minds and bodies. The latter two form part of our bodies. We need to nourish all the three and secure their help for our wellbeing. The adhidaivika deities are is their highest and purest. They exist in the heavenly world of Indra called devaloka. We can communicate with these beings through sacrifices and offerings. These gods are responsible for the welfare of the world and its order and regularity. They cause the rains to fall, rivers to flow, lightning to flash and crops to grow. They are responsible for cattle, progeny and the rest. The devas of the heavens are real beings who keep a watch over us. They are sensitive, passionate and driven by the prospect of pleasure. The keep a watch over our mortal world, just as we keep a watch on our cattle, because in our welfare lies their welfare. They do their best in keeping evil forces out of our world and our lives. Without their help our world would fall into chaos and darkness. During sacrificial ceremonies, they descend to the sacrificial place and accept our offerings. After being nourished, they show their gratitude by granting the wishes of the host of the sacrifice. The Vedic people worshipped them through sacrifices, held them in the highest esteem as the sum total of heavenly existence, relied upon them and sought their intervention in securing peace and prosperity upon earth. Through sacrifices, invocations and by making regular offerings they kept the gods well nourished. At the most basic level every object in the universe is made up of just five elements, earth, fire, water, air and space. In creation, these five elements are mixed in different proportion through a fivefold process (pancikarana) to manifest diversity. The elements are called bhutas. Of them fire, water and the earth are considered gross or physical. Air and space are considered subtle. The gross physical elements are responsible for the adhibhautika aspect in our bodies. It is represented by the physical organs present in the body. The deities who are hidden in them are responsible for all our physical actions and interactions with the external world. The acts of touching, smelling, speaking, breathing, procreating etc., fall under this category. They act as the guardians of the body, keep us in a state of wakeful alertness. Their mode is generally outgoing, except when we are asleep. The adhibhautika deities (devatas) are responsible for our attachment to the physical world of objects and sensations. By remaining engaged with the objects they create in us duality, desires, attachment and delusion. If we use them for selfish purposes, we incur sin and bad karma and remain bound to the cycle of births and deaths. It is therefore important that we use them with detachment and engage them in the service of God rather than in our own service. The subtle plane of gods in our bodies is manifested by air and space. The subtle deities exist in our bodies in the internal organ consisting of the mind, intelligence and ego. 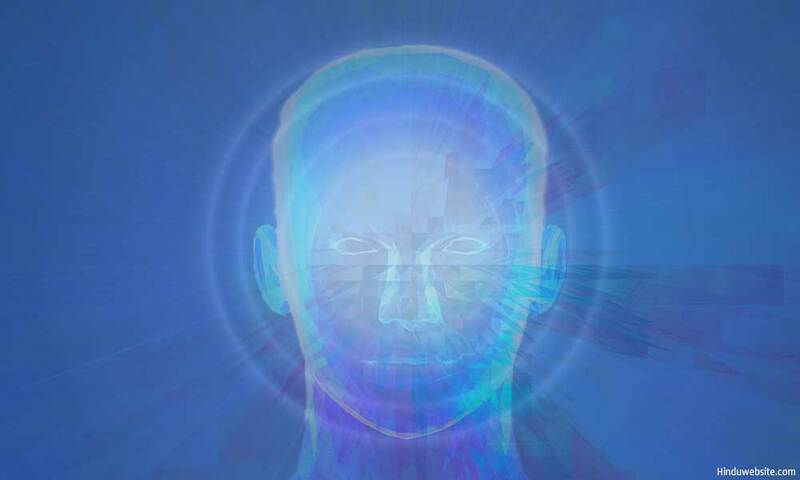 The gods who exist in them and form part of our subtle mind are called the inner ones or the hidden ones (adhyatmika). In their essential nature they are closer to the internal organ rather than to the physical body. We cannot reach them except in dreams, sleep and meditation. These subtle gods exist in all bodies, including those of plants and animals. However, they remain latent in lower life form and active in beings who are endowed with intelligence and self-awareness. Since the deities are subtle, they have a direct bearing upon our thoughts and intentions. If our intentions are good and our thoughts are pure, the gods shine brightly in our inner world with bright sattva and endow us with knowledge and intelligence. Otherwise they decline, lose their strength and stop responding to our calls for help. Many people complain that their prayers are not heard by gods. The reason is the gods respond to us only when they are properly nourished. If they are not nourished, they lose strength and become silent. When the gods fall silent our bodies become vulnerable to evil thoughts. Therefore, if you want to secure the help of gods, you must lead a divine centered life and remain on the right side of things. If you let the demons loose in your mind, you become vulnerable to evil thoughts and actions which lead to suffering and unhappy consequences. The gods, demons and humans are children of Prajapati. These three classes of beings have their own strengths and weaknesses. The gods have a weakness for pleasure. The humans have a weakness for greed and envy. The demons have a weakness for pride and cruelty. In the human body, which is the microcosm, the gods and demons exist in both gross and subtle forms. We are therefore vulnerable to both the influences and depending upon what we do, how we live, whom we support, in our thoughts and actions, we become pure or impure, and divine or demonic. The Bhagavadgita draws a straight line between the two by listing the divine and demonic qualities so that we can cultivate sattva, remain pure and work for our liberation. Of the three classes of Prajapati's children, only human beings have an opportunity to work for their liberation. It is because whatever transformation that needs to be achieved for self-purification can be accomplished only in the physical body with the help of discriminating intelligence. Hence, it is said that if gods and demons want to work for their liberation, they need to take birth on earth as human beings and assume human bodies. Hinduism is called a way of life because in Hinduism living and worshipping are synonymous. A Hindu worships God everyday through numerous acts of living. He views life as a sacrifice. Living is a sacrifice. Eating is a sacrifice. Procreation is a sacrifice. Speaking is a sacrifice. Every actions is an act of sacrifice while the fruit of such actions become an offering. In this sacrifice of life, the body becomes the ritual place, the thoughts, desires and actions become the offerings and all the inner divinities and the inmost Self or atman become the recipients of such offerings. Life is sacred. Since the body is the place where the gods pour offerings, our bodies are sacred. Therefore, we must embody the highest virtues and live austerely and righteously to facilitate the expression of divine through our organs. The gods and humans depend upon each other for nourishment, peace and happiness. The gods will decline, if we ignore them. We will decline, if the gods do not help us. The gods play a predominant role in our worldly actions and in achieving the three important aims of human life, namely dharma, artha and kama. In our search for our liberation, we need to turn our attention away from our minds and bodies and with draw them into the silence of our hearts.